1. Dry roast the wheat rava for a minute and remove. 3. Fry the mustard seeds and dal for 30 to 45 seconds. 4. Add the mushroom pieces and saute for 2 minutes. 5. Transfer to a large bowl. 6. Add wheat rava, curd, salt and coriander leaves. 8. Pour into greased idli moulds and cook in a pressure cooker for 2 to 3 whistles. 9. Remove and serve hot with coriander chutney. 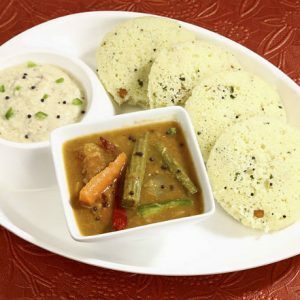 Feel free to comment or share your thoughts on this Mushroom Idli Recipe from Awesome Cuisine.